Day 11: Today we slept in a bit because it’s Sunday and the things that are open (not much) don’t open until 10 am. Pastries and coffee for breakfast, then a stroll through the old town (altstadt) of Nuremberg. The city is an interesting mix of old and new. It dates back to medieval times. Parts of the old town wall and guard towers are still standing. There are also many churches and other buildings that date back to Pre-Reformation times. 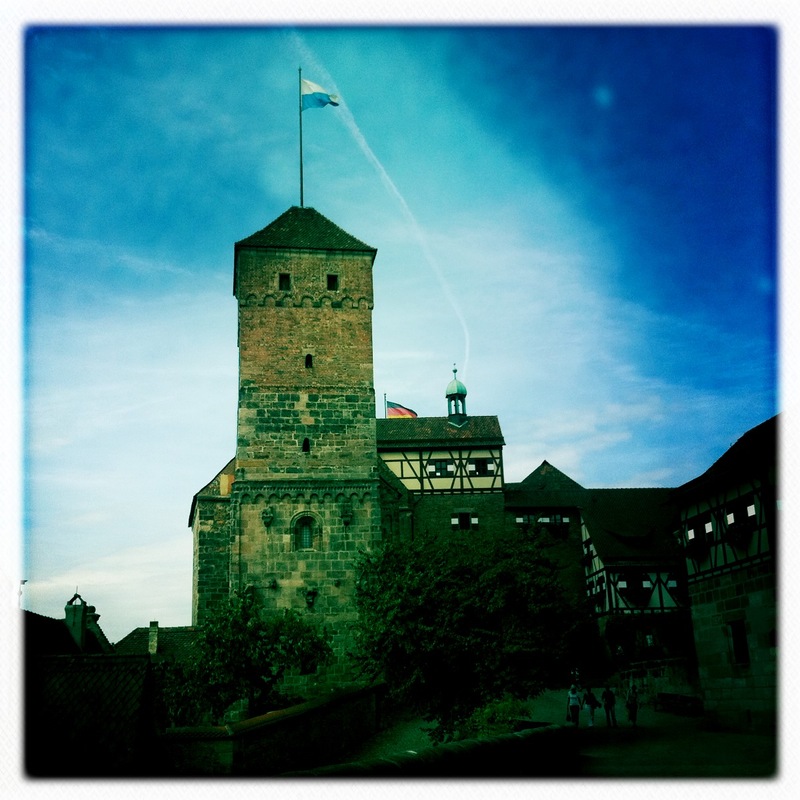 Aside from Dresden, Nuremberg was the hardest hit of German cities during WWII. If a building was damaged, it was repaired in the original Gothic style. If a building was completely destroyed, it was rebuilt in a style that was traditional, yet modern. There was a big bike race today, so the Market Square (Hauptmarkt) was full of vendors, biergartens and entertainment for the kids, including a bouncy house and small train ride. We had another death march through town dragging the kids up to the Kaiserburg (Imperial Castle) that over looks the city and offers spectacular views. 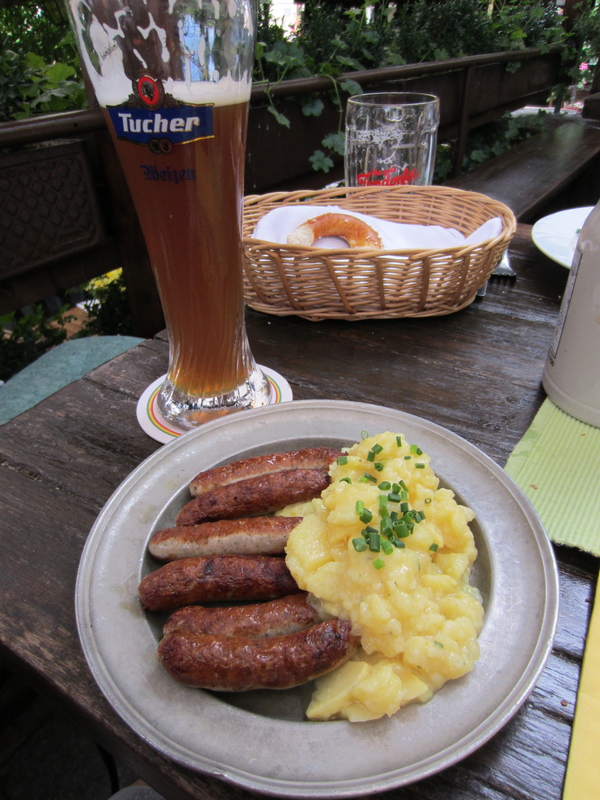 Lunch at Burgwachter restaurant is (my favorite) Colaweizen, cola mixed with wheat beer and Nurnburg sausages (tiny breakfast sausage-like sausages that Nuremberg is famous for) with potato salad. I’m still trying to get used to eating while everyone around is smoking. Yuck. After lunch we walked through Old Town some more and then back to the hotel for some R&R. In search of WI-Fi, I ducked into the Burger King in the train station, paid €.50 to use the WC and hid out while I checked my email. Much better than the €6 that the hotel wanted to charge for 30 minutes. While at the train station, I stopped by the variety store Müller to pick up snacks for our road trip to Berlin. For dinner we took a walk into town for some non-Bavarian food. For me it was pasta with mushroom sauce and chicken along with a wine spritzer and Caprese salad. During dinner it started to pour down rain. Looks like we’re in for mostly wet weather from here on out.